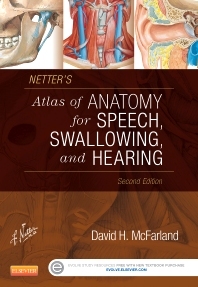 Filled with Dr. Frank Netter’s world-class illustrations and all the essential information on anatomy and physiology relevant to SLH, Netter’s Atlas of Anatomy for Speech, Swallowing, and Hearing, 2nd Edition uses a unique "read-it, see-it" approach to help you easily connect anatomy and physiology concepts to detailed illustrations. This full-color SLH-specific atlas contains a basic overview of anatomical organization systems, expanded content on swallowing, and updated discussions on the anatomical and functional bases of normal speech, swallowing, and hearing to give you a solid foundation in learning how to diagnose and treat SLH disorders. UNIQUE! Frank Netter’s medical illustrations and straightforward descriptions clearly present the anatomy and physiology of speech, language, and hearing to help you easily build the foundation necessary to diagnose and treat disorders. System musculature summary tables for each section present vital information in a quick, easy, and consistent format for study and reference. Evolve student resources include video clips of cadaver dissections, animations, self-test questions and exercises to enhance your understanding of SLH anatomy and physiology. A balance of text and illustrations with text on the left hand page and the related image on the right provides both the visual and written information you need to know in a "read-it, see-it" format.